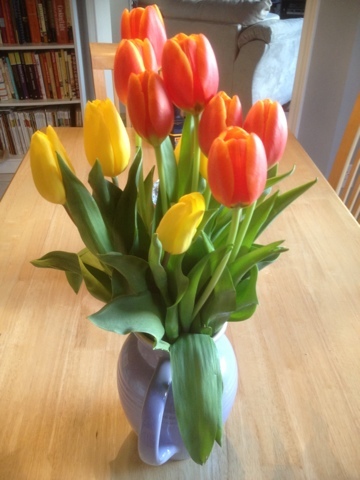 It has been a quiet week here on the blog but not at home. We had family in for a long weekend and I have been feeling rather poorly of late with the spike in allergens -- all of which adds up to very little knitting time. R and I leave town this Easter Sunday for a week long Smoky Mountain cabin vacation. It should be a great time. We have both been burning the candle at both ends for quite a while and are looking forward to some quiet down time. I will post about it after we return -- with pictures, I promise. In the meantime, have a great Good Friday and a wonderful Easter weekend! Lots of company this past week.... Stop. No time to knit... Stop. Same old socks on the needles -- though nearly done.... Stop. Second single spun on the wheel completed... Stop. Ready to ply this afternoon.... Stop. 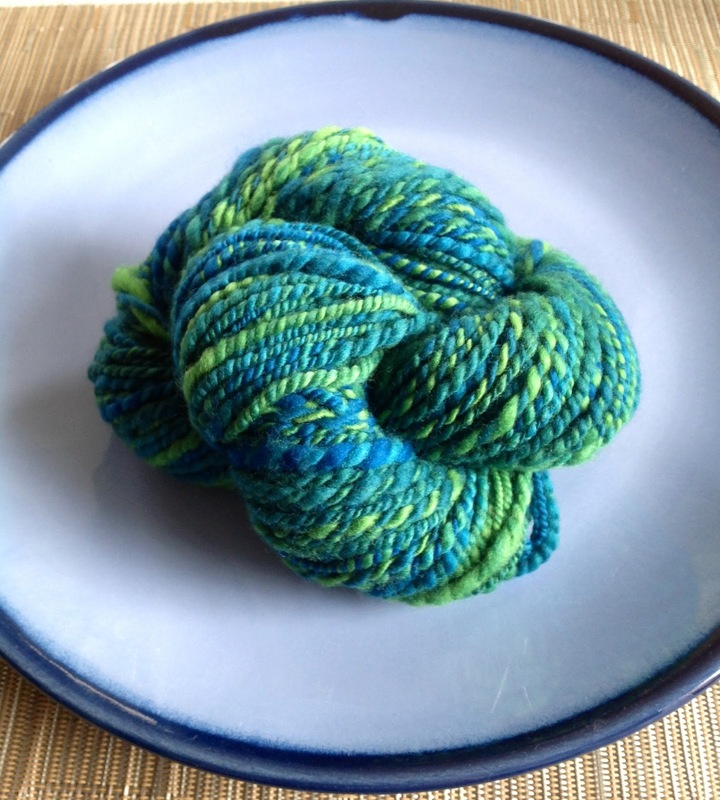 Joining Ginny@SmallThings and TamisAmis for Yarnalong and WIP Wednesday! This is Hobbledehoy's 50/50 blend of merino and yak. The colorway is called 'Pineapple'. It is the softest fiber I have ever held and so it naturally holds a place in my core fiber stash. I hear this is a common problem for new spinners -- but be assured that I am not skimping out on the good stuff. My lineup of fibers to be spun is a beautiful mixture of rare breed fibers and blends comprised of merino, falklands, wensleydale, and corriedale wools along with alpaca, camel, and silk. So far it all still fits in a treasure chest, but I think I may exceed those confines today. Time to find a bigger treasure chest! This week's word was Whirling. Joining the Mayberry Home Journal in the Lexicon Project. Well, we sprung forward last weekend. Yes, it is the time of year again when we change our time to "save" daylight. I do not mind falling backwards but springing forward always throws me off my game for a week or two. It is hard to sleep, and my internal clock is all wonky -- leaving me rather.... disagreeable. That would be this week's Ta-Da! I am now back on the boot socks. They are, as I noted before, nearly completed. At about 80%, I think they can be completed soon. 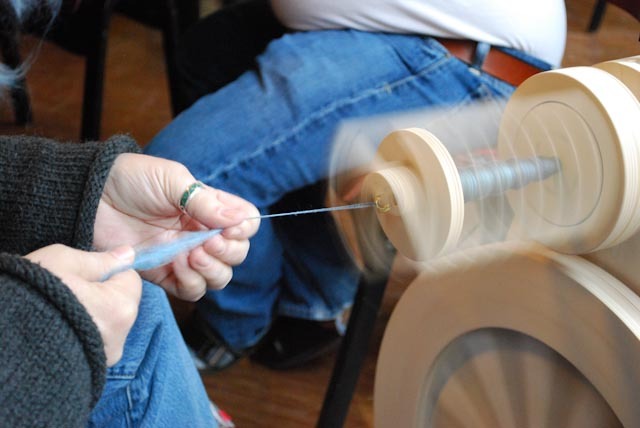 I am still spinning the fiber from last week. 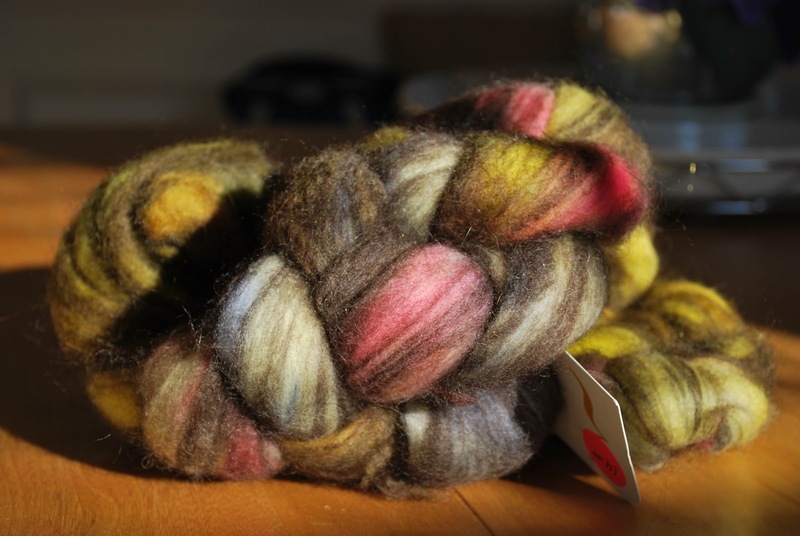 I have spun up 50% of it already and I cannot wait to ply it! Let me know what you are currently working on! Joining Steph@Woolythyme, Ginny@SmallThings, Linda@NaturalSuburbia, and TamisAmis for Yarnalong and WIP Wednesday! All day long yesterday I thought it was Wednesday. What a great surprise at the end of the day to find that today was going to be Friday! And if it is Friday, then it must be Fiber Fever Friday! Today's fiber came to us from Spirit-Trail.net . R and I indulged ourselves to double portions of the yarn and fiber clubs this year. This is February's shipment. 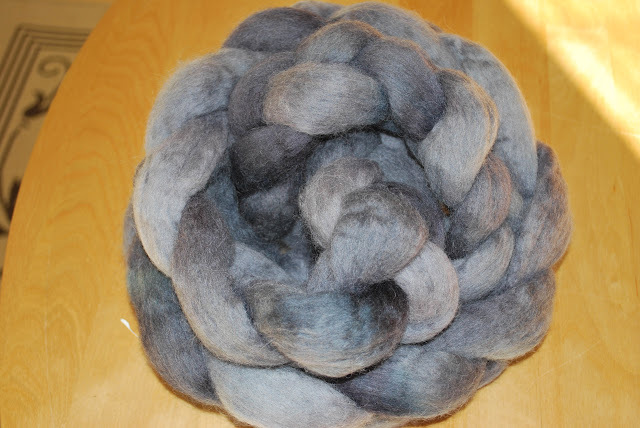 The yarn is Lina -- a Corriedale and Nylon blend (75%/25%) and the Fiber is 100% Corriedale. 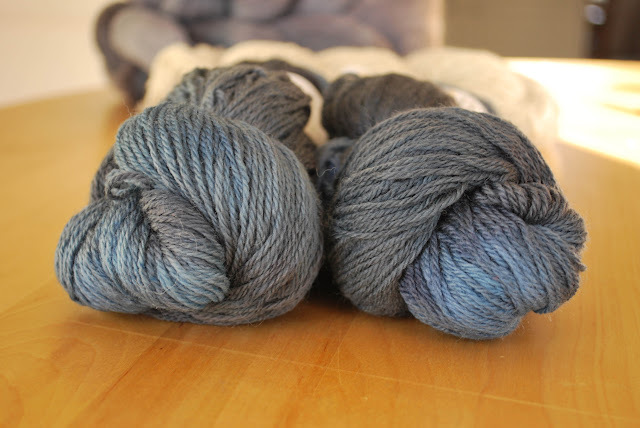 This is some seriously beautiful yarn to work with. As usual, Spirit-Trail comes through 100% for me in terms of fiber and color. 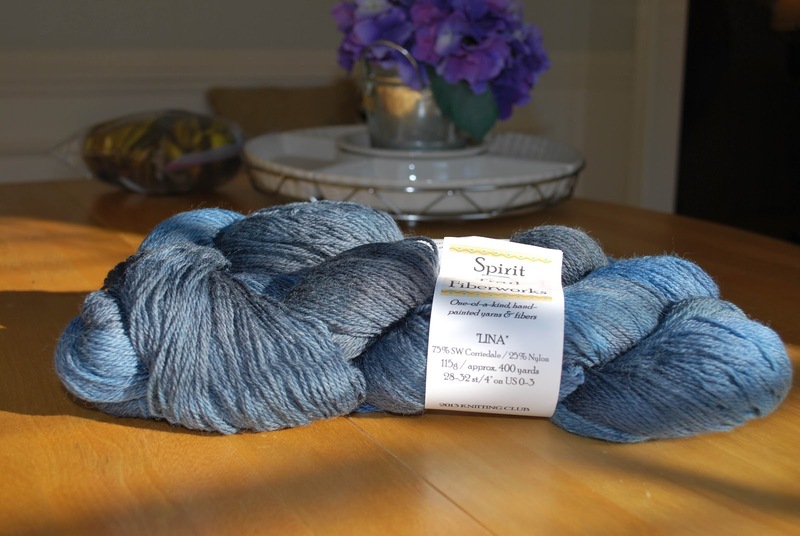 If you would like to get your hands on some Spirit-Trail yarn or fiber, please visit their page here. I hope you all are planning a relaxing, full fiber weekend -- I know I am! Joining Linda@Natural Suburbia for Creative Friday and TamisAmis for Finished Object Friday. Be sure to check them out to see what they have been working on! What is it about March? In particular, what is it about March 7th? In my own inner circle of friends and family members (which is a small group I can assure you) there are three people who were all born on March 7th. Are there that many people born on March 7th? 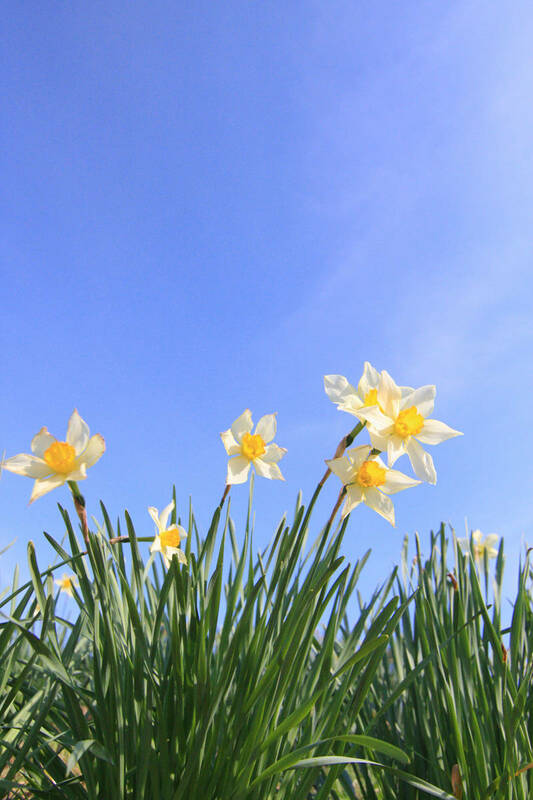 Is there a special mid-summer day of amore that I have not yet been married long enough to know about that is producing an odd number of March 7th babies? Is roughly 30% of the population really born on this day? So I am busy like a beaver trying to get birthdays handled and celebrated -- so my two WIPs are on a short hold. I am about 75% done with the re-knit of last week's cowl and I am also 75% done with those grey and brown boot socks. I am working to finish both of those this week / weekend. In the meantime, I have been spoiling myself on the spinning wheel. 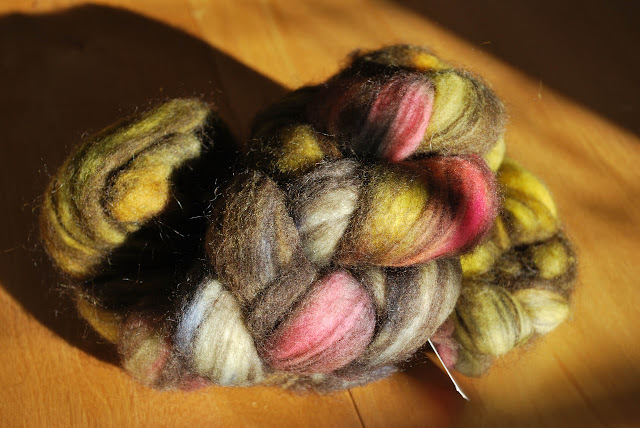 I have been working my way through Spinning Dyed Fibers with Felicia Lo on the Craftsy site. It is a wonderful class and she is a very fine teacher. I am learning a lot and practicing those techniques in my spare moments at home. This is me spinning a Falklands Combed Top hand dyed for me by the infinitely talented owner and operator of Spirit Trail Fiberworks. I am really enjoying spinning. It is so unbelievably gratifying to make my very own yarn. My only regret is that I did not get started doing this sooner. All things in their own time I guess... Apparently my right time was not until now. I hope you all are having a wonderful Wednesday and that your WIPs are flying off the needles at rates unprecedented! I am sending you all good knitting vibes today! 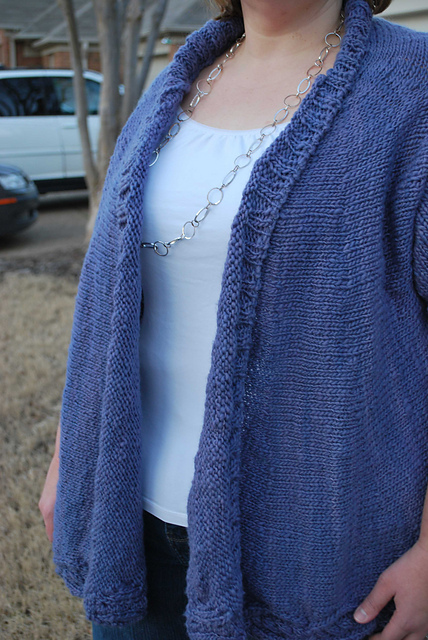 Joining Steph@Woolythyme, Ginny@SmallThings, and TamisAmis for Yarnalong and WIP Wednesday! Good Morning and Happy Ta-Da! Tuesday Everyone! Today is Ta-Da! Tuesday and there is definitely a Ta-Da!, but we are going to change it up a bit this week. 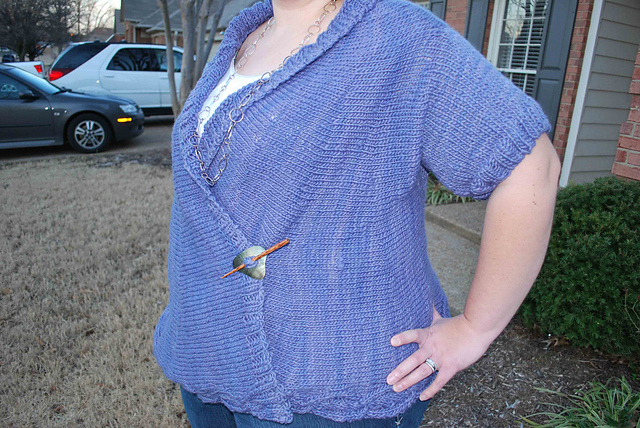 For those of you new to the blog, I am a knitter, crocheter, and -- recently -- a spinner. What you may not know, however, is that I am married to a wonderful woman who -- in order to spend more quality time with me -- decided last spring to take a class and learn to knit. R has been knitting now for about 10 months and is a natural. She has fearlessly tackled cables, lace, and the altering of patterns to suit her own personal style. This morning R will be guest blogging about her most recent FO. It is a beautiful piece and I know you will all enjoy her way with yarn as well as her way with words. Now, to my Ta-Da! 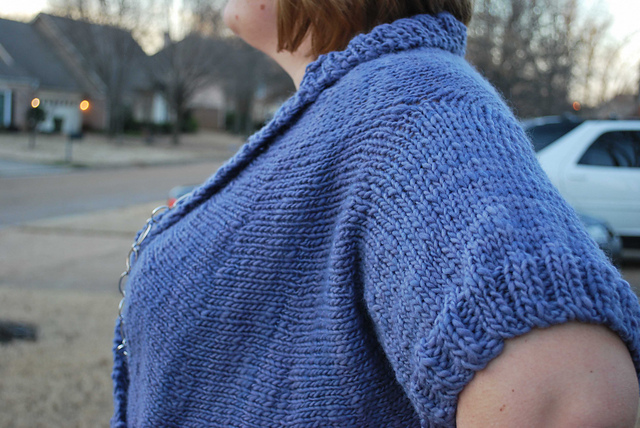 I'm fascinated with the idea of test knitting and sample knitting--I love the idea of it. I love the process of helping a designer finish a product; I love being one of the first people to make something new; I love knitting, but I rarely wear my own work--preferring to give it away as gifts or sell it because I don't want to be the one that messes it up. As I was trolling in the Testing Pool group on Rav one day, I came across a call for completing a test knit that I couldn't pass up. 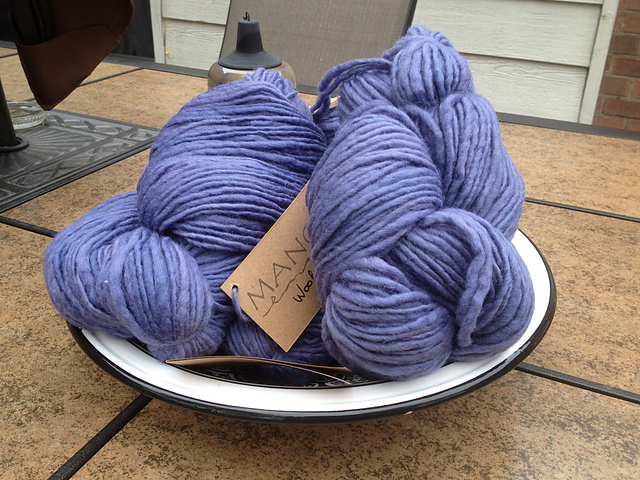 So, I signed up and dutifully bought 8 skeins of Manos del Uruguay Classica in cornflower. Beautiful, right? After diligently finishing, washing, and blocking my swatch and choosing a needle size (I almost always have to go up one because I knit tightly. ), I was off to the races. 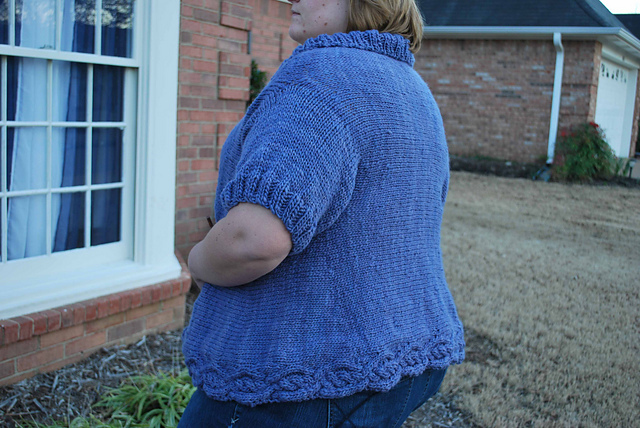 The pattern for the sweater is now available on Ravelry and is called Emilie June. It has an awesome side-to-side construction, so no seaming for the folks that prefer to avoid such difficulties. 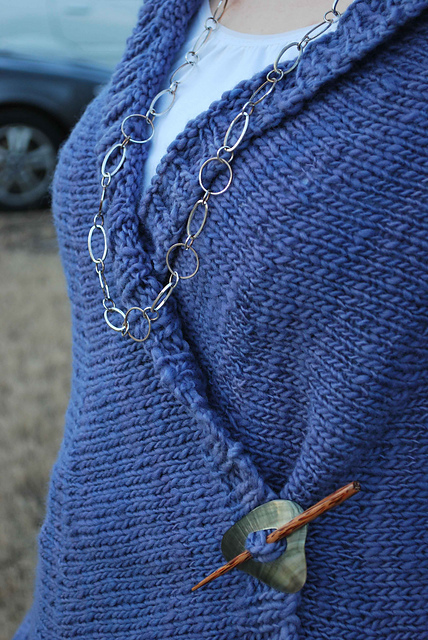 There's a neat cable design along the bottom edge and a comfy shawl collar. The sleeves are done almost like the afterthought heel--you knit in a piece of waste yarn where the sleeve will go and then keep knitting. Once you're ready to do the sleeve, you just pull out the waste yarn and pick up the stitches and off you go. How cool is that? One of the things that I love about knitting is that you learn something new every time--this time, my new skill to learn was how to do hidden short rows in stockinette. I'm not going to lie--I made J. do the tink and redo the first set after I messed it up, but then I figured it out and just look how good I did! As usual, I didn't really want to keep it and be the one to wear it out, it's also pretty significantly too big if I wanted to keep it, so it's off to a new home as a gift. The cardigan is super warm and soft. I'm not a huge fan of the thick and thin aspects of the Manos Classica generally (why do the thick bits and thin bits always seem to pool together--you'd think they would even out. Perhaps this only happens to me...), but they worked out well in this pattern. I also decided to be super brave and didn't alternate balls of yarn--the luck of the knitter was with me though, because none of my skein changes are noticeable. Here are a few more pics for good measure, a little bit so you can see how well the design elements worked out, but mostly so you can see how awesome I did. I am currently visiting family out of state so we will make today's post short and sweet. This was a lovely roving that I got through a destash a friend if mine was doing... It is 100% merino wool dyed blue and green. I was aiming for a worsted weight two ply and I think I managed to hit that -- although I haven't yet tested the WPI. What have you been working on? Please share your FOs in the comments!